XPEL's Ultimate Paint Protection Film combines best-in-class durability and clarity not previously available in the market. With its very low surface energy, XPEL ULTIMATE PLUS sheds contaminants that would otherwise stain or yellow conventional films. In addition, the clear coat employs special elastomeric polymers that "heal" over time eliminating swirl marks and other fine scratches without having to do anything. This product carries a 10 year warranty against, yellowing, cracking, peeling, staining, and hazing, and reimburses both film and labor in the unlikely event of a failure. XPEL ULTIMATE PLUS is truly the most revolutionary Paint Protection Film ever invented! Visit www.xpel.com to view the complete list of vehicle, motorcycle and RV clear bra paint protection patterns. Start protecting your vehicle's paint finish with Xpel Ultimate today. GIve us a call today for an estimate. 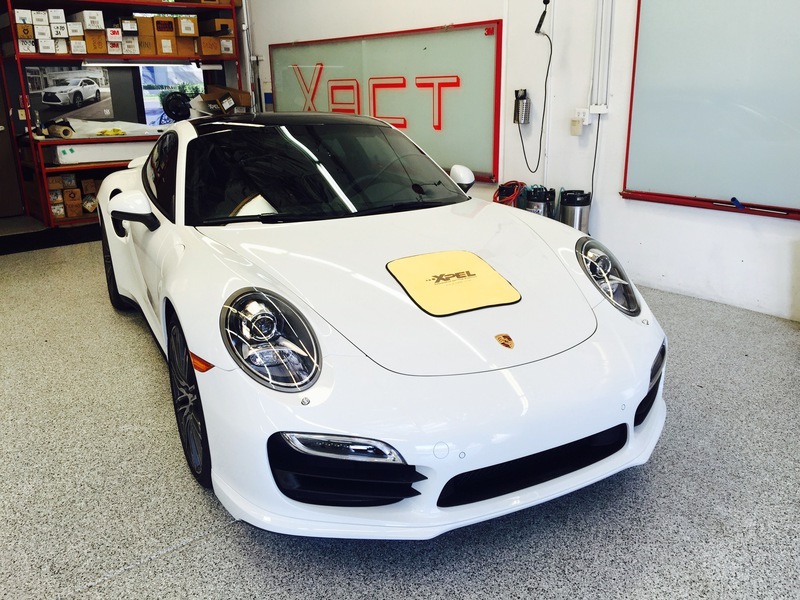 "How does XPEL ULTIMATE PLUS Paint Protection Film heal itself?" The time for a scratch to heal depends on the severity of the scratch and the ambient temperature. Minor scratches usually heal in one hour at room temperature (72Â°F). In warmer climates, healing time will be shorter. The healing process can be accelerated at any time by pouring hot water over the scratched area. "How does XPEL ULTIMATE PLUS Paint Protection Film resist staining?" "How is care of XPEL ULTIMATE PLUS different than other films?" Unlike most paint protection films on the market, XPEL ULTIMATE PLUS Paint Protection film can be waxed and sealed just like your paint. Though XPEL Flawless Finish Paint Protection Film Sealant is still the preferred product, Any automotive wax or sealant may be used. "Will XPEL ULTIMATE PLUS make the paint underneath the film fade at a different rate?" "Does XPEL ULTIMATE PLUS Paint Protection Film install the same way as other films?" XPEL ULTIMATE PLUS can be stretched just like any other paint protection film. The only difference that will be felt is that some extra force will be needed to stretch the film due to the greater density of the clear coat. "What does the XPEL ULTIMATE PLUS 10 year warranty cover?" XPEL warrants XPEL ULTIMATE PLUS Paint Protection Film to be free from defects in materials and workmanship for ten (10) years from the date of purchase. Covered defects include: yellowing, staining, cracking, blistering and delaminating. This warranty does not extend coverage to damage caused by normal wear and tear, road debris impact, accidents, collisions or intentional damage of any kind.